The Grand Canyon Area Travel Guide is a resource for those planning to visit Grand Canyon National Park and other locations in and around the Grand Canyon and Northern Arizona. The area features diverse outdoor recreation and some of the world's most spectacular sightseeing. Grand Canyon's Inner Canyon lies nearly a mile below the rims within Grand Canyon National Park, roughly 4,700 feet below Grand Canyon Village on the South Rim and 5,700 feet below the North Rim village. The Inner Canyon is a world completely apart from the rims which are largely cool, wooded forests offering distant views of the canyon's depths. 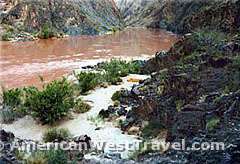 The canyon within is a mostly shadeless desert with summer temperatures well over 100°F (38°C) at the Colorado River. The presence of springs and streams create pleasant, shaded oases in places such as Phantom Ranch. There are numerous sandy beaches along the river. On the trail within the canyon you get a much closer appreciation of the sheer walls and fantastic cliffs. Despite the arid country, there are places where fabulous waterfalls can be found, such as at Deer Creek (right) and Thunder River. In the spring, pretty wildflower displays and cactus flowers can often be found. While it is easy to visit the North or South Rims, reaching the bottom of the canyon is not an easy endeavor. The least expensive and most accessible method is by hiking. It is by far the most strenuous method, even for experienced backpackers or physically fit individuals. The NPS guide comments "first time Grand Canyon hikers tend to react to the experience in one of two ways: either they can't wait to get back, or they swear they'll never do it again." My own experience was hiking to the bottom seven times on progressively more challenging trails in progressively more remote parts of the canyon. Following an extremely difficult 60-mile, one week trek (see Hiking the Jumpup, Kanab, Deer Creek Canyon Loop - Death March or Grand Adventure?) my urge was satisfied, and I never returned. Other means of reaching the bottom are less strenuous but still require much effort. Mule Trips are a popular way of reaching Phantom Ranch. It does require an all day ride on the mule each way which is quite an effort. Also, you must not be afraid of heights! You will often be looking into thin air from the top of the mule. The trips are moderately expensive but reservations are not easy to get. You can also reach the bottom on a raft trip which may be the most exciting way but also the most expensive way. Whatever way they choose, most people feel a great sense of accomplishment for having made the effort to see this unique and special place. There are various ways of accessing the Inner Grand Canyon, all of them exciting and most of them quite strenuous. These include day hikes, backpacking, mule rides, river rafting, and air tours. Day Hike. You cannot reach the Colorado River with a day hike but can get a taste of the Inner Canyon. Hike a few miles down any trail and then return. Remember that the return hike will always be very strenuous. The best South Rim day hike is the Dripping Spring trail. It is 3.2 miles each way with a moderate 1,000 foot elevation drop. So the return trip is not extremely strenuous. From Hermits Rest, take the Hermit Trail 1.5 miles (past the Waldron Trail), then turn onto the Dripping Springs trail for 1.7 miles. The trail goes along the head of Hermit Canyon (a huge and scary dropoff) and eventually reaches Dripping Spring which is a lush oasis and an excellent place for lunch. On the North Rim, the only day hike would be on the North Kaibab Trail. Points of interest would be Coconino Overlook (1.5-mile round trip), Supai Tunnel (2-mile round trip), and Roaring Springs (9.4-mile round trip). Roaring Springs is over 3,000 feet below the rim and would be an all day hike. No permits are required for day hiking. Backpacking. Hiking to the bottom of the Grand Canyon is a highly popular activity. It is an extremely strenuous endeavor, especially in summer when temperatures reach well over 100°F (38°C). The Inner Canyon is largely a desert, without much shade. Therefore most visitors must stay at least one night in the canyon to complete the trip. Permits are required to camp in the canyon. (A backcountry permit is not required for overnight stays at the dormitories or cabins at Phantom Ranch.) Advanced reservations for Grand Canyon Backcountry permits are necessary and strongly advised. See the NPS Grand Canyon Backcountry Hiking page for more information. Most people stay at the Bright Angel campground, 0.3 mile from Phantom Ranch. The ranch has bunkhouses available to hikers. Reservations well in advance are mandatory. You can also reserve breakfast or dinner there. There is also a small canteen. For more information, visit the Phantom Ranch site, or call 303-297-2757 or 888-297-2757. Bright Angel Trail. The most commonly used trail from the South Rim. Recommended for beginners. Drinking water, emergency phones, and toilets along the way. There is a campground at Indian Gardens, 4.7 miles from the trailhead. This is a shaded oasis and a good spot for lunch. It is 9.6 miles from the rim to Phantom Ranch. Trailhead is at Grand Canyon Village. South Kaibab Trail. The trail is shorter - 7.2 miles to Phantom Ranch - but much steeper than Bright Angel. It is also shadeless and waterless. Trailhead is at Yaki Point on the South Rim. North Kaibab Trail. The trail from the North Rim is a long hike for one day - 13.7 miles to Phantom Ranch. Cottonwood Campground has water at mile 6.8. Very scenic trail. Mule Trips. Day trips are offered from the South Rim to Plateau Point; overnight trips from the South Rim to Phantom Ranch. The overnighters include lodging at Phantom Ranch's cabins, plus all three meals. There are size restrictions for riding the mules, and you must not be afraid of heights! Reservations must be made very well in advance (up to 13 months). For more information, visit the Mule Rides into the Grand Canyon site, or call 303-297-2757 or 888-297-2757. North Rim mule rides do not go to the river. Trips ranging from an hour to 1/2 day go along the rim or into the canyon as far as the Supai Tunnel or Uncle Jim's Point. For more information, contact Canyon Trail Rides, or call (435) 679-8665. Raft Trips. The most exotic way to see the Inner Grand Canyon is by a white water raft trip. Many people consider such a trip one of the highlight's of their lives. The canyon's white water is world famous as of course are the views. Private parties can enter a lottery to run a noncommercial trip down the river. Most people sign on with commercial, guided raft trips. It may take a year or more to get a reservation for such a trip. It generally takes one to two weeks or more to run the entire Grand Canyon. The shorter trips are accomplished with motor-powered rafts; the longer ones powered the old fashioned way, by oar. These are rigorous trips, with the running of many powerful rapids, very cold river water (temperature is in the 40s°F (4s°C) year-round), and camping every night on beaches. Some outfitters offer half-trips, where you hike in or out at Phantom Ranch which is roughly the midpoint of the canyon. For more information, see the park service's list of authorized Grand Canyon river rafters. For those who wish to have a taste of river rafting, Colorado River Discovery runs convenient half-day trips in Glen Canyon which is just upstream from Grand Canyon. Trips start at Page, Arizona, at the base of the Glen Canyon Dam, and run downstream to Lee's Ferry (the starting point for Grand Canyon trips). You are then taken by bus back to Page. While there is no white water in Glen Canyon, the gorgeous scenery is very comparable to Grand Canyon. The Hualapai River Runners conduct one to two day raft trips from Diamond Creek to Lake Mead in the far western end of Grand Canyon. This would be convenient to visitors staying in Las Vegas. Air Tours. Tours by airplane and helicopter are available out of the town of Tusayan, just south of the park. The Grand Canyon Chamber of Commerce lists several operators. Guided Trips. The Grand Canyon Field Institute offer a variety of classes and guided trips with an educational emphasis. Activities include backpacking, camping, day hiking, and whitewater rafting. Phantom Ranch. Located at bottom of Grand Canyon. Cabins available as part of mule trips. Bunkhouses (inexpensive) available to hikers. Breakfasts and dinners (expensive) available by reservation. For reservations and information, contact Grand Canyon National Park Lodges, the park concessionaire. Permits are required for camping under the rim of the canyon. If you want to stay in these developed campgrounds which have water, toilets, picnic tables, emergency phones, Grand Canyon backcountry permit reservations should be made well in advance. Indian Gardens - On Bright Angel Trail, 4.6 miles from South Rim. Wooded, shady oasis. Bright Angel - North side of Colorado River, 0.3 miles from Phantom Ranch. Wooded oasis along Bright Angel Creek. Cottonwood - In Bright Angel Canyon 6.8 miles below the North Rim. Mid-way point on North Kaibab Trail to Phantom Ranch. Water in summer only. Definitive guide to the wide range of hiking opportunities in world-famous Grand Canyon National Park. The ever-popular Sierra Club Totebook is an information packed guide to America's best-known national park. This video combines 3D animation with on-the-trail footage to present the Grand Canyon from the hiker's point of view. Ideal for the first time hiker. We offer pages covering Grand Canyon scenery, the inner canyon, hiking trails, hiking tips, a guest rafting story, and a feature narrative on backpacking in the canyon. The South Rim of the Grand Canyon is 80 miles northwest of Flagstaff, Arizona, via US-180. The North Rim is 44 miles south of Jacob Lake, Arizona, on state 67. Each is approximately a 5 hour drive from Phoenix or Las Vegas. The North and South Rims are roughly 200 miles apart by road, via the Navajo Bridge on US-89a. Or, 26 miles by foot trails.